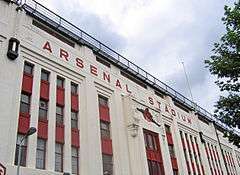 Arsenal Stadium was a football stadium in Highbury, North London, which was the home ground of Arsenal Football Club between 6 September 1913 and 7 May 2006. 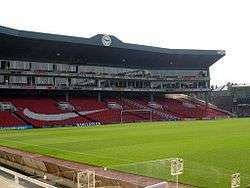 It was mainly known as the "Highbury Stadium" due to its location and was given the affectionate nickname of the "Home of Football" by the club. It was originally built in 1913 on the site of a local college's recreation ground and was significantly redeveloped twice. The first reconstruction came in the 1930s from which the Art Deco East and West Stands date. There was a second development; the first phase was completed in 1989 which added executive boxes to the Clock End, and afterward in 1993 a new North Bank Stand was constructed, both following the recommendations of the Taylor Report which replaced the terraces to make the stadium an all-seater with four stands. However, further attempts to expand the stadium were blocked by the community, and the resulting reduction in capacity and matchday revenue eventually led to Arsenal opting to build a new stadium, to become known as the Emirates Stadium in nearby Islington. 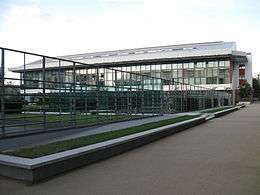 After the club moved to their new stadium upon the conclusion of the 2005-06 season, Highbury was redeveloped as a residential development known as Highbury Square, with the Clock End and North Bank stands being demolished; parts of the East and West Stands remained and were incorporated into the new development due to their listed status. In addition to its architecture, the stadium was known for its small but immaculate pitch and for the famous clock which was positioned in the southern side of the ground since its introduction in 1930. The Clock End was redeveloped in 1988/89 with the addition of a roof and 48 executive boxes , while seating was fitted into the remaining standing area in 1993. In the early 1990s, the Taylor report on the Hillsborough disaster was published, which recommended that football stadia become all-seater. The North Bank, which had become home of Arsenal's most passionate supporters, was demolished at the end of the 1991–92 season. During redevelopment, a giant mural of fans was placed behind the goal at that end, to give the illusion that the players were kicking towards a crowd rather than a construction site. The mural initially attracted criticism for its absence of black fans, which was quickly rectified. Populous (then LOBB Partnership) designed all-seater two-tier North Bank Stand, the last area of Highbury to be refurbished, which was opened in August 1993 at a cost of £20 million amid strong opposition from local residents. The new North Bank Stand contained a museum and a concourse with video arcades, bars, confectionery counters, souvenir shops and fast-food stands. While the all-seater North Bank was "never the same as the old-fashioned Archibald Leitch stand" that it replaced, it was "much more like the future of Arsenal than the past" with its added anemities and "Gone were the days of pushing a petrified child through a packed crowd and placing them on a barrier from which they could only see a small section of the pitch". The old stand had received a fitting send off with a 5–1 defeat of Southampton, though the new stand had a less auspicious start, the first game being a surprise 0–3 defeat to Coventry City with all 3 goals coming from striker Micky Quinn. The first victory came 10 days later against Leeds United. As of 2010, Arsenal Stadium was redeveloped and converted into flats in a project known as "Highbury Square", a scheme that had 711 properties built on the site. The North Bank and Clock End stands were demolished. The exteriors of the listed Art Deco East Stand and the matching West Stand were preserved and incorporated into the new developments, while the rest of the stands' structures were removed, and the pitch became a communal garden. In October 2005 the proposed flats went on sale; as of May 2006 all properties in the North, East and West Stands had been taken. Arsenal's famous clock was moved from Highbury to the outer side of the new stadium, with a new larger version of the feature added inside the ground in August 2010. At the same time as the unveiling of the new clock, the south stands at the venue were also renamed Clock End inline with the same name previously used at Highbury. In Charlie Higson's post-apocalyptic young adult horror novel The Enemy (2009), nine-year-old "Small Sam" is kidnapped by a group of grownups and taken to a spectator box in which they have set up camp, in Arsenal Stadium, after a worldwide sickness has infected adults turning them into something akin to zombies. Sam ultimately escapes, only after setting his captors afire (which ultimately sets the structure afire), and dodging various groups of adults scattered throughout the stadium structure and playing field. 1 2 "Old Highbury". Flickr. Retrieved 2007-01-23. ↑ "Arsenal property deals send profits to record high". BBC News. 24 September 2010. 1 2 "Key Facts". Arsenal F.C. Retrieved 2007-01-23. ↑ "Emirates Stadium: New goal for the Gunners". The Independent. London. 4 December 2006. ↑ "The Arsenal Clock | Arsenal's Heritage | History". Arsenal F.C. 1 July 2008. 1 2 3 4 5 "A Conservation Plan for Highbury Stadium, London" (PDF). Islington Council. p. 7. Archived from the original (PDF) on 20 June 2007. Retrieved 2007-01-23. ↑ Spurling, Jon (2007). Highbury The Story of Arsenal in N.5. London: Orion Books Ltd. p. 12. ISBN 978-0-7528-7639-9. ↑ "Arsenal's First Game at Highbury". Arsenal F.C. Retrieved 2007-01-23. ↑ Fagan, Sean (2006). Kangaroo Tour: 1921–1922. Australia: rl1908.com. Archived from the original on 2 January 2011. Retrieved 20 February 2011. ↑ Soar, Phil & Tyler, Martin (2005). The Official Illustrated History of Arsenal. Hamlyn. pp. 75–76. ISBN 0-600-61344-5. ↑ "Highbury – A history". Arsenal F.C. Archived from the original on 18 August 2008. Retrieved 2008-08-18. ↑ "Arsenal v Hapoel Tel Aviv 1951". Footysphere.tumblr.com. 1 2 Hornby, Nick (1992). Fever Pitch. Indigo. pp. 142–3. ISBN 978-0-575-40015-3. ↑ "Club Records: Appearances/Attendances". Arsenal F.C. Archived from the original on 18 August 2008. Retrieved 2008-08-18. ↑ "Woolwich To Have New Ground at Highburg-- English Football News". The Daily Telegraph and Daily Witness. Montreal. 19 August 1913. Retrieved 2012-12-09. ↑ "Arsenal Stadium Highbury, Arsenal FC". Old Football Grounds. Archived from the original on 26 January 2010. ↑ Gleiber, Steve. "Arsenal Football Club – The Glorious History, 1987 to today". Archived from the original on 5 February 2007. Retrieved 2007-01-23. ↑ Murray, Callum (11 August 1993). "Architecture: A grand stand for football: At Arsenal, new safety standards and innovative design are being used to turn the game into family entertainment. Callum Murray applauds". The Independent. London. Retrieved 17 February 2012. ↑ "Quinn spoils North Bank party | News Archive". Arsenal F.C. 14 July 2007. ↑ Garrett, Alexander (2006-09-24). "Pool, gym, garden, marble halls...". The Observer. London. Retrieved 2007-01-23. ↑ "Arsenal Stadium, Highbury". Arsenal F.C. Archived from the original on 2008-01-11. Retrieved 2007-01-23. ↑ "Super Surface at Emirates". Arsenal F.C. Retrieved 2007-01-23. ↑ "Arsenal Football Club plc". The Political Economy of Football. ↑ Garner, Clare (18 August 1997). "Arsenal consider leaving hallowed marble halls". The Independent. Retrieved 2012-12-09. ↑ "Where is Arsenal". Goonernow.co.uk. ↑ "New Stadium Secrets". Arsenal F.C. ↑ "Highbury farewell photos". BBC Sport. 2006-05-07. Retrieved 2013-03-29. ↑ Wallace, Sam (8 May 2006). "Arsenal 4 Wigan Athletic 2: Highbury story ends with last act of sublime skill from Henry". The Independent. London. ↑ "Arsenal Game 2 2006". Football Aid. London. 8 June 2006. ↑ "The Highbury Auction – Arsenal under the hammer". Pocket Lint. 2006-04-19. Retrieved 2014-02-22. ↑ "Toxic fears hit Highbury auction". BBC Sport. 2006-05-10. Archived from the original on 20 December 2006. Retrieved 2007-01-23. ↑ "Highbury Square Development (Revised Scheme)". Islington Council. Archived from the original on 2 August 2009. Retrieved 2008-08-18. ↑ "The Arsenal Clock". Arsenal F.C. 2010-08-21. Retrieved 2011-01-05. ↑ "Buy a home at The Stadium, Highbury Square!". Arsenal F.C. Retrieved 2014-02-22. ↑ "The Arsenal Clock | The Club". Arsenal F.C. ↑ "Emirates Stadium's new Clock – Pictures | News Archive". Arsenal F.C. 23 August 2010. ↑ "GGM 39: Seven Gunners selected for England | History". Arsenal F.C. 25 July 2007. ↑ "Most Players from a Single Club in an England Team". Englandfootballonline.com. Archived from the original on 28 September 2007. ↑ "XIV. Olympiad London 1948 Football Tournament". Rec.Sport.Soccer Statistics Foundation. Archived from the original on 4 January 2007. Retrieved 2007-01-23. ↑ "English Grounds For World Cup". The Guardian. November 1962. Quoted in Belam, Martin (18 November 2009). ""1966 and all that..." – Contrasting England's 1966 and 2018 World Cup bids". ↑ "Inter-Cities Fairs Cup 1955–58 Results". FootballSite.co.uk. Archived from the original on 18 December 2006. Retrieved 2007-01-23. ↑ Soar & Tyler (2005). The Official Illustrated History of Arsenal. p. 197. 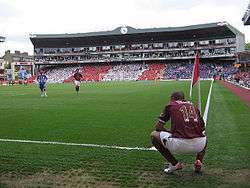 ↑ "Football takes a back seat at Highbury | News Archive". Arsenal F.C. 7 July 2007. ↑ "1966: Cooper loses to world champ Clay". BBC News. 21 May 1966. ↑ "BFI Screenonline: Arsenal Stadium Mystery, The (1939)". Screenonline.org.uk. ↑ "The Football Oscars: The Damned United, Escape To Victory, Goal, Gregory's Girl, The Football Factory, There's Only One Jimmy Grimble, Fever Pitch, Shaolin Soccer, Goal 2, Loo". Mirrorfootball.co.uk. ↑ "Record Scorelines | History". Arsenal F.C. 8 July 2008. ↑ "Arsenal at Highbury – a complete record". Arsenal F.C. Retrieved 2007-01-23. ↑ Includes Premier League, First Division and Second Division. ↑ Includes Champions League, Cup Winners' Cup, UEFA Cup and European Super Cup. ↑ "England's Matches at London Grounds". England Football Online. Retrieved 2007-01-23. ↑ One of these matches was a 3–0 win against a "Rest of Europe" side in 1938; although caps were awarded at the time, FIFA have since struck it from their records as an official international. The Football Association continues to recognise it as an official match. Reference: "England's Official Internationals: The Disputed Matches". England Football Online. Archived from the original on 20 February 2007. Retrieved 2007-01-23.